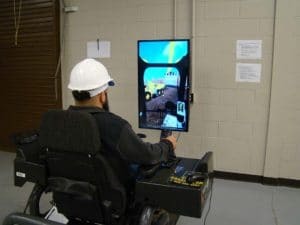 Making the Heavy Equipment Operator (HEO) Program at Wake Tech a reality has been a combined effort of several people. For 25 years, Ronnie Lowe has been with Wake Technical Community College, North Carolina. Last year Lowe got the program started, serving as the Senior Professor/Instructional Department Head. Lowe’s background in the diesel industry runs deep—more than 40 years as a technician, service manager, owner/operator and instructor. That experience helped him shape the HEO program at Wake Tech. He’s since passed the baton to the capable hands of Jon Paige Kearns, Professor and Department Head, Heavy Equipment and Transport Technology (HEATT) and Heavy Equipment Instructor, Jared McDonough. Wake Tech currently offers a Heavy Equipment Operator diploma program and two certificate programs. Simulator training is integrated into the curriculum. After Wilson Tech closed the only Diploma HEO program around 2009, the Wake Tech president asked Lowe to work up the costs of starting an HEO program. Wake Tech already had a Heavy Equipment repair program in place since 1975. Because of the cost of land in Wake County recommended for the program, the original push for a program was stopped. Later that year Lowe was introduced to simulators and, noting the advancements in simulation, he started brainstorming ideas. 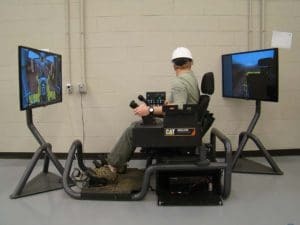 He then organized a meeting with industry stakeholders, Caterpillar, another machine company, community college officials and Wake Tech Administration to consider a program using simulators as the primary training tool. At this meeting, local industry people agreed to do the hands on training through Work Base Learning (formerly co-op) and apprenticeship programs. From the results and support of that meeting, the HEO program was started. Kearns has been in his position in the HEATT program since 2003 and took on the addition of the HEO program last year. In 1993, Kearns graduated from the HEATT program, putting him in a unique position to have experienced not only being a student, but later professor and department head. McDonough has worked in the construction field for his entire adult life. He retired from the U.S. Army where he spent 20 years in the heavy equipment field before taking a position as an Instructor. 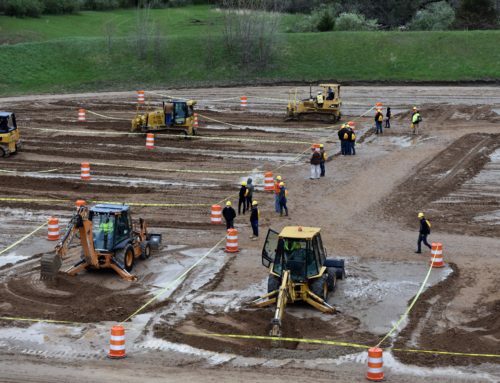 The school currently has several simulators, including Cat® Simulators systems for the M-Series Motor Grader, Dozer and Hydraulic Excavator. 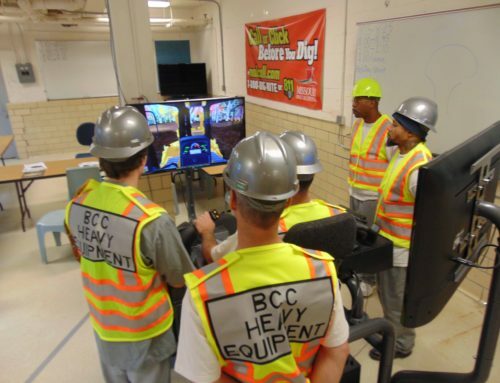 Lowe says, “With the current state requirements, we are running an estimated 350 hours of hands-on time on the simulators.” The program utilizes training from the simulators for other parts of the curriculum as well—such as the simulated Walkaround and eBook materials (an interactive textbook), which are featured as part of the classroom and equipment safety classes. Simulator training helps students better understand equipment safety. 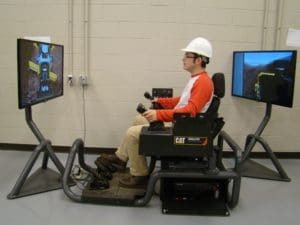 McDonough says, “To have the ability to start students out on a simulator makes it a lot less stressful for them, trying to learn how to operate or what the controls do without the fear of breaking something.” Simulation allows the instructor to have more confidence in the student before sitting him or her on a real machine. From a safety standpoint everyone wins. McDonough explains that a primary focus of simulators is to help students understand the coordination of multiple machine functions working in synchronization with each other. The simulators teach this valuable lesson through rigorous exercises that students must pass before moving forward to more advanced exercises. 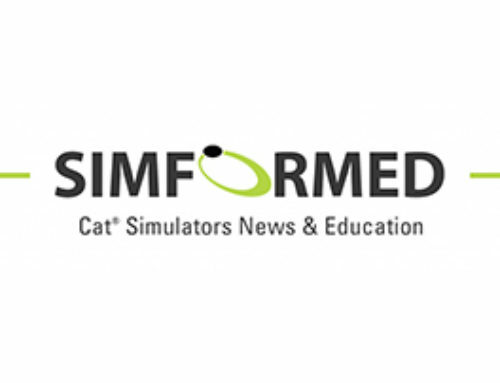 A method of measuring student progress on Cat Simulators is through SimU Campus™ software, which records and reports the results of user simulation sessions. The records management system can also be customized to meet the needs of each student by adjusting the difficulty level of the training exercises according to the semester the student is in. Instructors are able to keep the records to determine the students’ overall grades and track their progress. The program also utilizes actual machines for the on-the-iron training portion of the programs, with several of the live machines that match the simulators. However, there are some caveats to the iron training. “We cannot dig below ground level but we have piles of rock to move and grading of our yard. Students get the actual feel of digging and depth perception on the simulators. While not the best operating conditions, it still enhances the program,” says Lowe. Lowe goes on to point out that this does not include operation cost of equipment or the safety factor. He emphasizes, “You cannot put a price on safety. The simulators create a safe, and very visual way to see students digging near buildings, underground objects, etc. and hitting them. 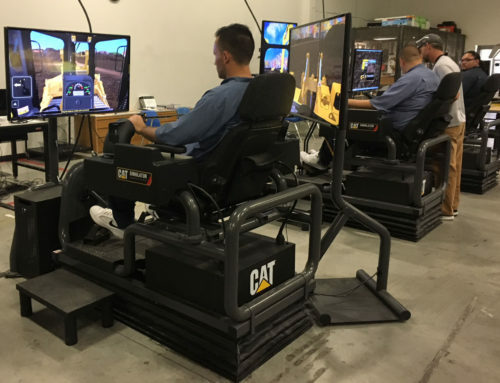 The outcome though is that they only cause damage to their score.” For example, on the Hydraulic Excavator, Cat Simulators teaches students the need to position the machine and bucket correctly while digging. Students are measured on their techniques during simulation and additional training can be administered as needed to help the student overcome weaknesses. Simulation training helps students learn and understand multiple machine functions. Plans are underway to add more Cat Simulators to the program. In January 2018, the college began offering a Heavy Equipment Operator, Associate Applied Science degree, along with two certificate programs. Advertising is planned to help get the word out. In addition, the college wants to add a service of pre-screening applicants for local jobs to make sure they have the skill set needed before employment. For their part, local companies and local contractors are getting involved in the program. The companies are giving feedback to instructors on what the HEO market is looking for—and what would make each student more marketable. These same businesses are employing some graduates through Wake Tech’s work based learning class or after completion of the Associates Degree. From start to finish and beyond, Wake Tech is growing the local workforce with skilled, heavy equipment operators.